A long day, a hard life. This post seeks to compare everyday life in rural and small-town Peru to our lives in Canada. While I think people in Peru are generally happy with their lives (in terms of family, friends, and neighbours), life does look to be far more difficult than in Canada. It makes me wonder why, in Canada, we seem to complain about the least little thing when our standard of living and level of privilege appears to be considerably higher than in Peru. 1. To what extent does luck play a role in our lives? 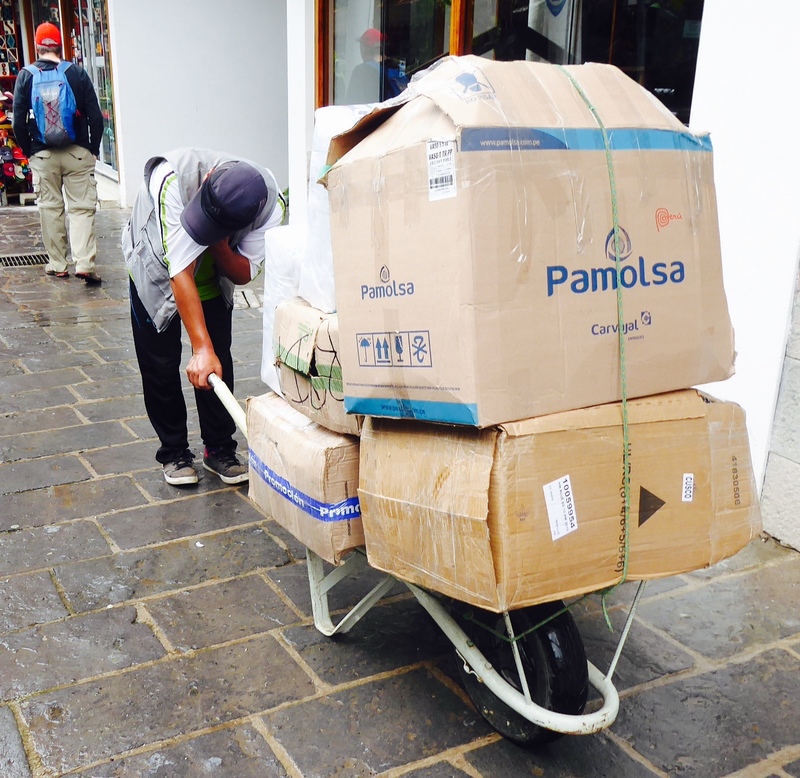 A man about my age (late 70s), pushed what looked to be a backbreaking load along a street in Aguas Calientes (I), the last small town before Machu Picchu. He stopped and leaned over breathing hard. After resting a few moments, he straightened, stretched, and with gritty determination grabbed the handles of his wheelbarrow and continued. As we passed, our eyes met, he nodded and we smiled. While he was obviously weary, the smile and sparkling eyes suggested a happy man. As he continued along his uphill path, I continued down taking more photos of life in small-town Peru. A few minutes later, I met another man pushing a similar barrow full of goods (photo in the footer), and he too wore a happy smile accented with sparkling eyes. We also exchanged smiles and passing nods. It looked to be a tough life for the two men their later years. 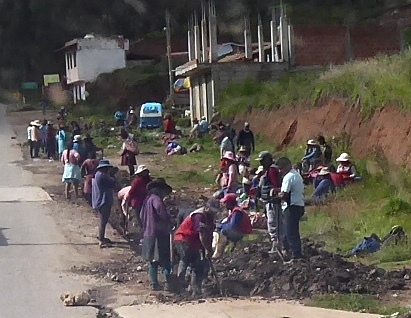 Later that day, while passing through another small town, a group of townspeople (photo taken from our bus as we drove through) was cleaning (or rebuilding) a drainage ditch. We are told by our guide that everyone in small towns sprinkled across rural Peru, have a standing obligation to help build, then keep public works systems clean and functioning. It looked to be a tough way to spend the weekend, but there is also the aspect of a community working together to make life better for everyone. This photo shows only one part of a large group of people spread over two or three blocks on the edge of their village. They were working to build or repair a drainage system, an essential part of these high mountain communities (we were outside Cuzco at about 12,500 feet at the time). 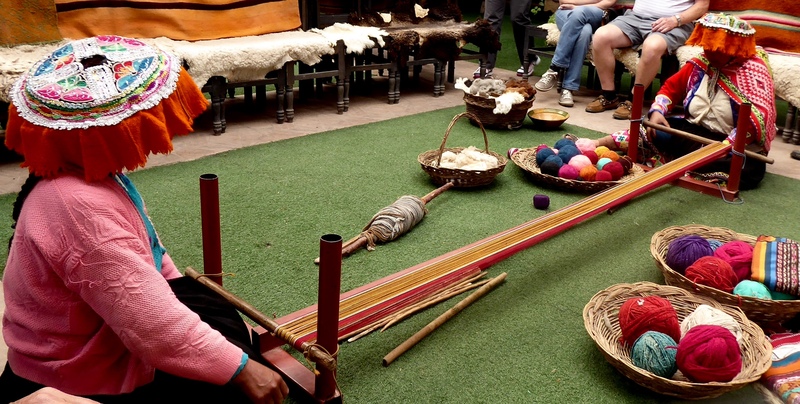 The photo below, along with a slideshow) provides a glimpse of a group of women, ancestors of the Inca, who, with the help of a National Geographic grant, started a weaving business a few years back. 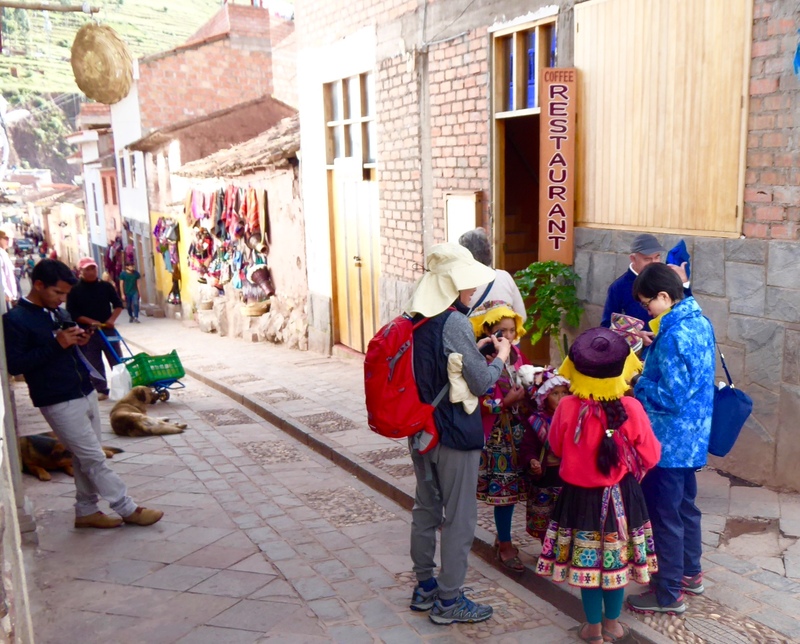 They now have a thriving operation that caters to an increasing number of tourists passing through their village of Chinchero, a community of about 20,000 Quechua (catch ur ah) speakers, located on a 12,500 foot plateau a few miles northeast of Cuzco. While they work exceptionally hard (by our standards at least), their efforts provide only a modest living for their families. A full outline of their business venture is described in a National Geographic article of some years back. Such is the working life for many ordinary men and women in Peru and other South American countries. Think about this. If we were dealt different cards in life, we could be any one of these men or women, and they could be us. Whether we carry a heavy load in the third world, or we lay back watching a big screen TV in Canada (a smartphone tucked by our side) a good part of the reason we are where we are, is based on the luck of our birth.